So I have a confession to start this Monday–all of my herbs from my little potting bench on the back patio have died. Every last one of them. They’re all gone. It’s kinda sad, but I can’t say I’m surprised. They were doomed from the get-go, even though I started out the summer completely convinced that I could do it. And I had a good run there for a while, but I’m seriously the worst plant person in the whole world. And yes, plant person is the correct lingo. I was either watering them too much or not at all, which isn’t so good for herbs apparently. Anyway, they’re long gone which means the vintage cubby I used for my potting bench was no longer serving much of a purpose other than housing dead plants. So this past weekend we cleaned it up, brought it inside and put it in our front room. I actually turned it into a little mini library for my old books and of course I had to add some fall decor in just for fun. It turned out super cute and I’m excited to show you guys how it looks! Believe it or not, this doesn’t even include all of the old books I own. My obsession is real, folks. But they sure do come in handy when it comes to styling things like this. Or anything really. I use old books in every single room in our home and I never pass them by when I see them at thrift stores or garage sales. ALWAYS BUY THE BOOKS. That’s my motto and I’m sticking to it. 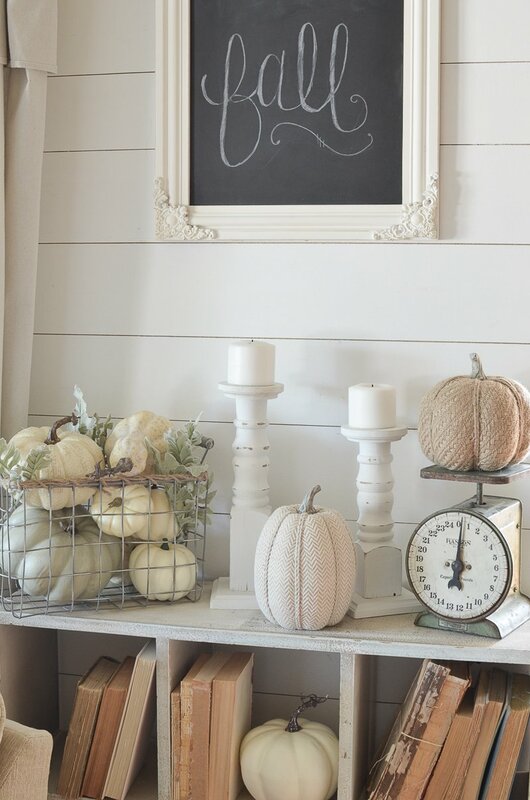 The antique scrolling on this vintage inspired chalkboard is just gorgeous. I seriously love this thing, it has so much character and charm. I’ve gotten so many questions about my faux pumpkins and they’re all from Michael’s. 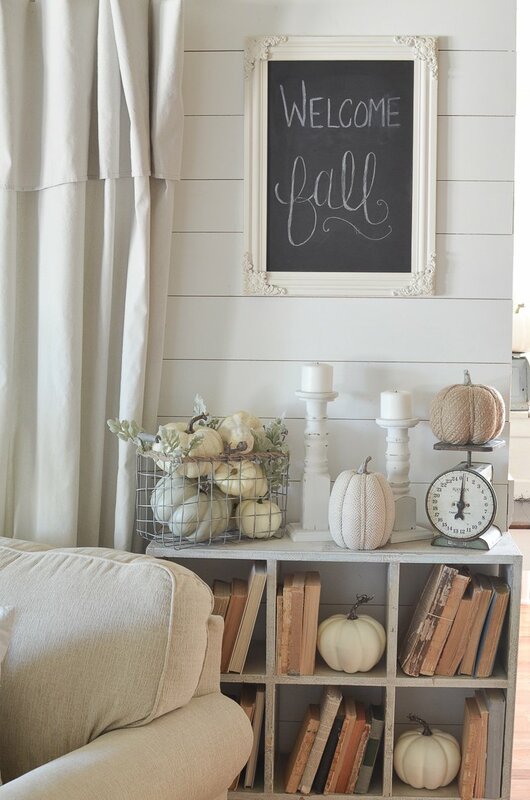 I loved their Fall decor this year and that’s where I always stock up on pumpkins. I’ll definitely buy some real ones soon too. But to be honest, I would much rather spend my money on the faux ones because then I can use them year after year. Well I think this vintage cubby is much more suited for indoor use than it was for plants on the back patio. And I was so surprised to see how well it fit in this spot in our front room. I mean, it kind of makes the perfect little library for old books. I actually thought about hanging it on the wall, but that sucker is super heavy. Then you pile a bunch of books in there, a vintage scale and some pumpkins and this thing weighs about a gazillion pounds in no time. So sitting it on the floor was the way to go with this guy. Definitely. Thanks Jenny! Hope you have a great Monday. LOVE IT!!!! Wouldn’t change a thing, oh and with the holidays coming up it will look great! 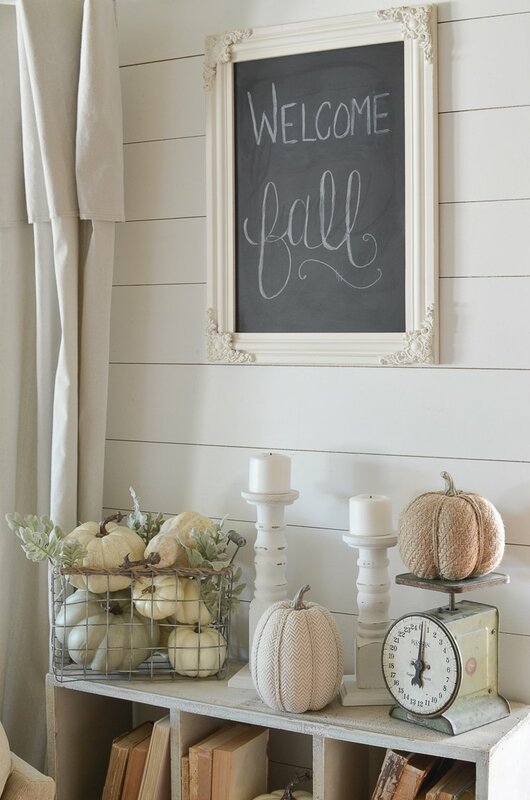 I also put out all my fall decorations this weekend, and am taking it more the natural looking route this year without using all of it….less is more for me this fall season. I thought of that same thing Tammy, it will be so fun to decorate this cubby for Christmas. Can’t wait! 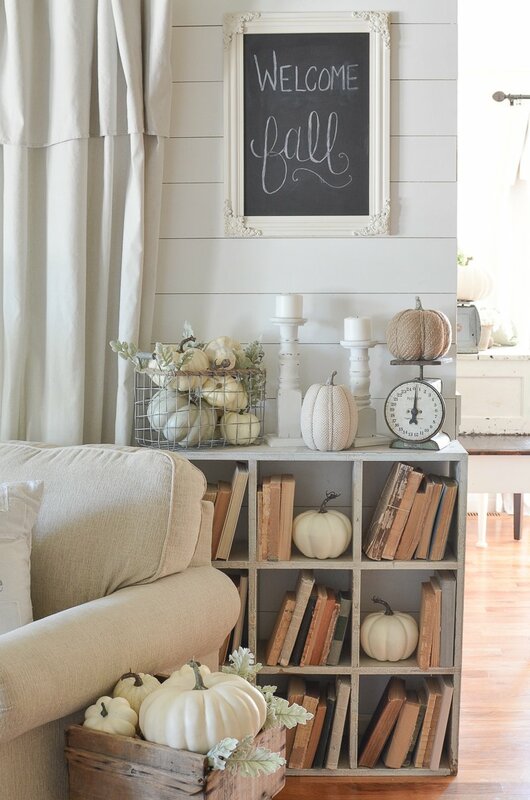 Hope you have a great week and have fun playing with your fall decor! I love the cubby in the house! Nothing better than a piece that you can move around. So did you find your faux pumpkins in these pretty colors? Thanks Rachel! All the faux pumpkins are from Michael’s. Love it, Sarah! As much as I love orange, esp. 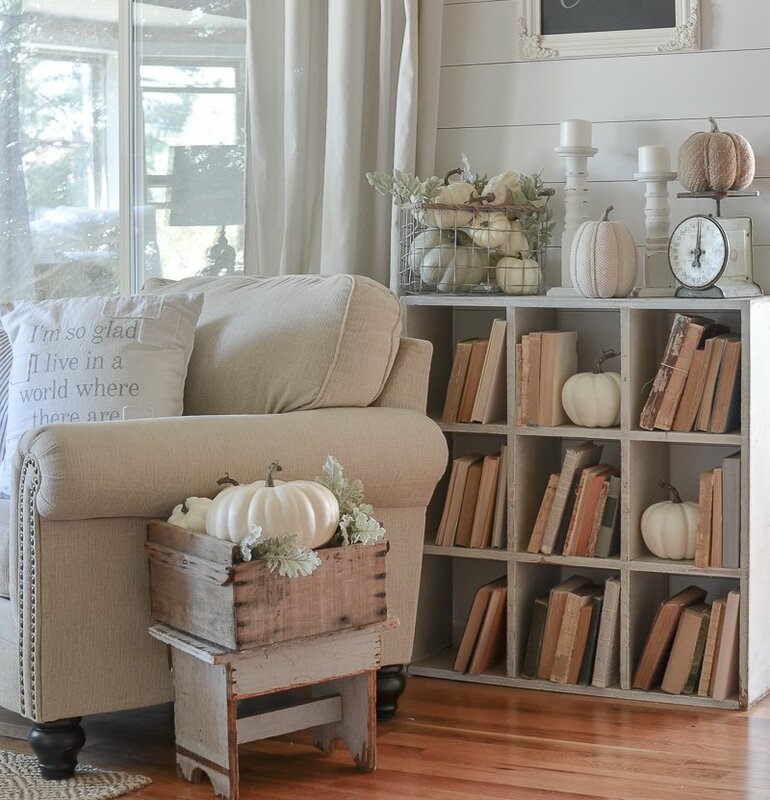 since it’s our favorite college team color, I’m inspired to use more neutral colored pumpkins in my decor this year, so need to get to Michaels. Just got an email that they are on sale this week! Will still use more orange fall decor outside, but looking forward to changing things up inside this year. Autumn is truly my favorite season. Your vintage cubby looks fabulous with the old books, I also have an affinity for old books and they are so inexpensive at thrift stores and garage sales. Just an idea, but have you thought about adding some wooden feet to the cubby to raise it up off the floor a bit? You could buy new ones to paint and distress to match, or maybe find old ones, or cut some from sections of large spindles. For some reason I love heavier wooden furniture pieces up off the floor a bit, but that’s just me, it is charming either way! We actually thought about doing that exact thing Vicki! I even have four pedestal legs from Home Depot that would work perfectly and they are ready to go. Just not enough time in the day to do it all, but hopefully I can soon! That looks just perfect there! 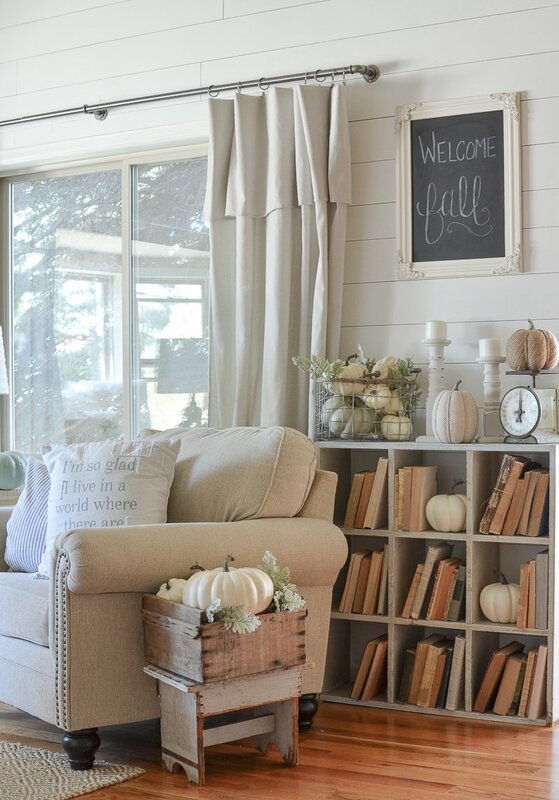 I love the way that you’ve accessorize it with the books and fall decor! Very vintagey!! Thanks Deedra, it’s a fun piece to style! LOVE all the old books! i have been finding a bunch at our local library in the free section. quick question: do you always take the covers off the books?? Hi Mary! Yes, I usually do take the covers off the old books if they’re too bold for my taste. But if the covers are really worn and have lots of character or more of a neutral tone I will leave them alone. Love your style! I am going to have to make a trip to Michael’s! What is the name of the greenery you have used in this display? Thank you so much for sharing you beautiful home!! Hi Carol! That greenery is called dusty miller or lamb’s ear. It should be in with the fall florals at Michael’s. Have fun decorating! LOL – sounds like we both have brown thumbs. Oh well, the potting bench is still adorable! Love what you’ve done with it. ha! Those poor plants never stood a chance! Love it all! You’re so good at styling your house and such great ideas! Thanks as always for sharing! I read your blog everyday, it’s my favorite! Have a great day! Love love love your vintage cubby!!!!! You inspire me everyday!! I was planning on painting some vintage books I have that don’t fit in with a neutral palet, but you’ve saved me hours of time, going to take off the covers/bindings. Thank you!! Heck yes Cynde, just rip off the covers! You will love them that way! I just love your blog!! 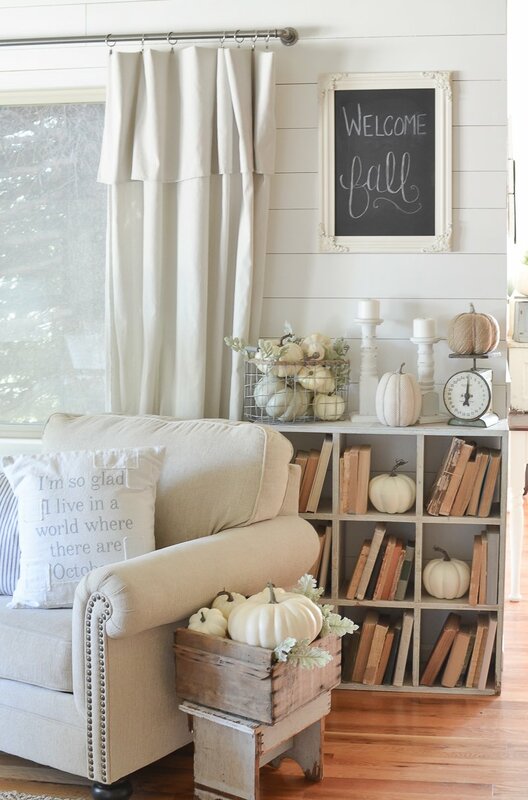 I love the softer side of Fall also. I have just started my decorating, but I also used mostly white pumpkins and some dried flowers from the yard. I found a few blue pumpkins to add to the mix. Your blog is always so inspiring. Your photographs are beautiful. Sarah..you come up with the cutest designs..I loved the potty bench and now I love yr bench inside. Im sure it is going to look amazing for the different seasons. 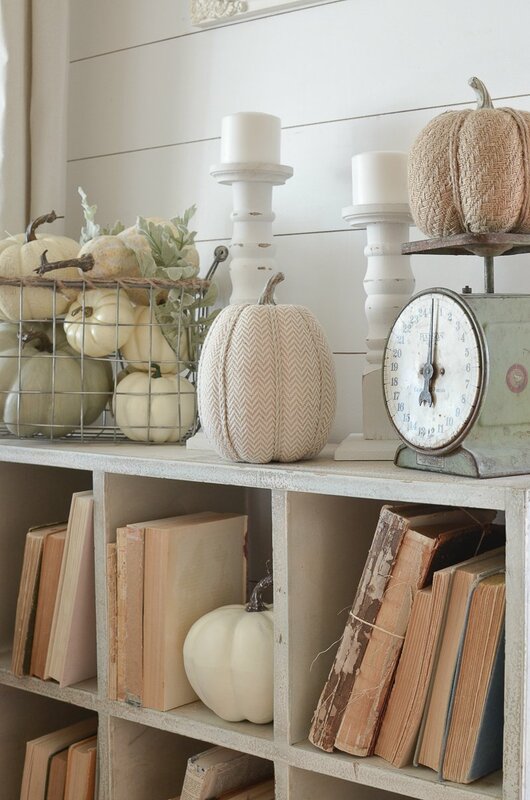 You know I love decorating with real pumpkins but maybe I should invest in some faux pumpkins..the problem is ..where to store after u r finished with them. With real when they r done I just put them in the compost. Thank you so much Lorri! And you know what, I actually just store my faux pumpkins in a large plastic bin in our basement. 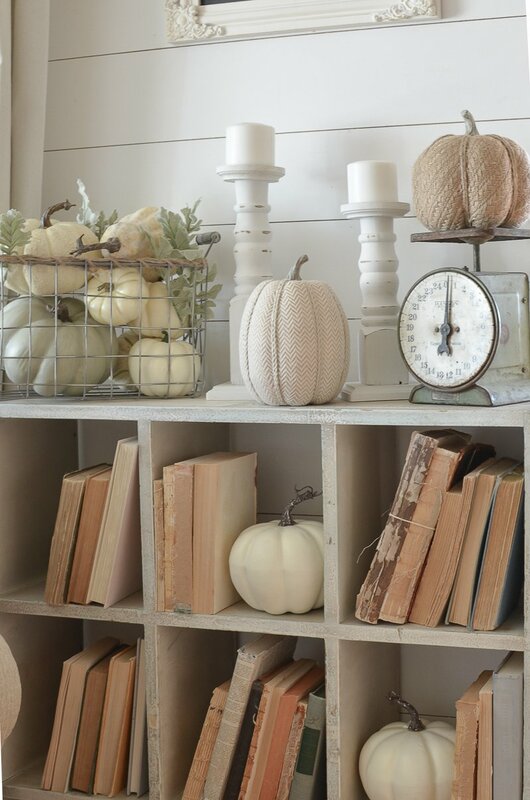 I have a few just for fall decor. They take up space for sure but it’s worth it to me! That is stinkin’ cute!!! Never cease to amaze me with your creativity! I was at Joanne’s today and they didn’t have the same white pumpkins. Michaels is now on my list to stop by. Thanks for the inspiration!